Save the Date - May 12th Benefit Dinner and Concert with Pete Escovedo and his Latin Jazz Orchestra! This has been a busy and unusual school year at Oxbow. The Napa/Sonoma County fires in the fall were unprecedented in their scope and impact on the broader community. Thankfully, Oxbow came through unscathed, but that is not true of so many around us. After some winter rains, the scorched ridges are turning green very quickly, but that does not diminish the damage that was wrought. As we all watched the recent mud slides in the Santa Barbara area, we are all too aware that there may be more in store. We don't take anything for granted and are grateful for a strong school spirit and resilient community. We welcomed OS38 students three weeks ago, and they are already deeply immersed in life at Oxbow. It is always a pleasure to greet an enthusiastic group of young people ready to dive right in. We have a busy spring in store, so please mark your calendars for some upcoming key events. Saturday, May 12 will be a very big day at Oxbow. The Final Show Open House for the public is from 2:00–5:00 p.m. We will also be hosting our Spring Benefit Concert that same Saturday evening. We are very pleased to announce that the legendary Pete Escovedo and his Latin Jazz Orchestra will be performing, so make sure you mark your calendars. More information will be forthcoming soon. The Benefit Concert is at 6:00pm, a short walk from Oxbow at The CIA at Copia where guests will enjoy refreshments and have the option to partake of a delicious sit-down dinner, or you may purchase a concert-only ticket. Dinner with concert tickets are $350 each, and concert-only tickets $125. 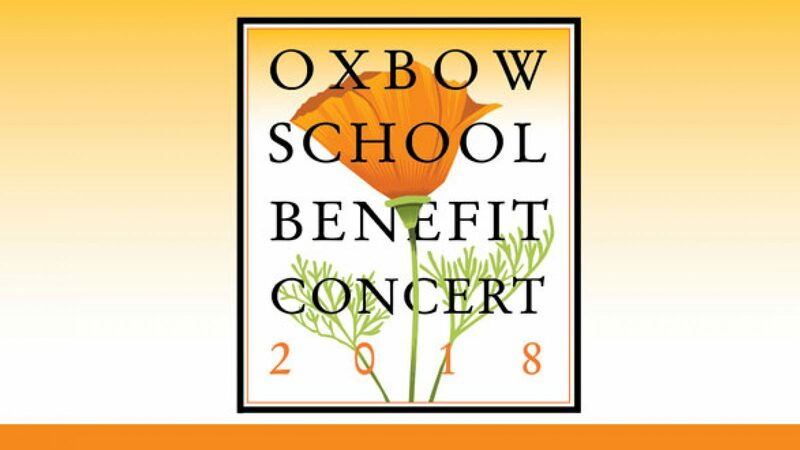 Tickets and sponsorships can be purchased online at www.OxbowBenefit.org. Sponsorship letters with more details will be sent shortly, so keep an eye out for yours. Leading up to the Benefit, the Robert Mondavi Winery will be hosting a curated Oxbow Visiting Artists Art Show. There will be an Opening Reception at Mondavi on Friday, April 27 from 6–8pm. In the school's 18+ year history, over 120 professional Visiting Artists have graced our program, and so far over 70 have generously donated a piece to the Works on Paper Exhibit at Mondavi in support of the Stephen Thomas Scholarship Fund. We are delighted by their generosity—we hope you can come! We will also be offering an online Wine Auction for the two weeks leading up to the Benefit. Stay tuned for details on this special fundraiser in conjunction with the Spring Benefit. Finally, Oxbow will be hosting an Ox-Campout overnight on campus for all Alumni June 2nd and 3rd. Alumni, please tell your friends, mark your calendars, and most importantly, COME and enjoy two days on campus! There will be Oxbow-style art projects, bbq and a special tour of the Oliver Ranch Sculpture Garden on Sunday. We will offer dorm rooms and alums may also camp on the campus for the night. Not to be missed! More details to follow. I hope this newsletter finds you in good health and fine spirits, and I look forward to seeing many of you on campus in May and June.